All transactions are safe and secure with a reliable history in online purchasing behind each of our associates. Buy the Goonies Silhouette t-shirt to own Goonies clothing and merchandise. 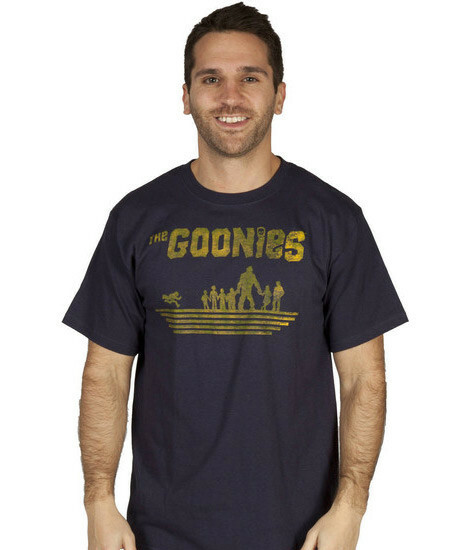 The front of these tees display the familiar logo from the Goonies movie poster art featuring a silhouette of the Goonies and Chunk. The actual poster features the kids inside of the cave with a pile of treasure in front of them and One Eyed Willie's ship in the background. Mama Fratelli (Anne Ramsey) is creeping up behind them with her eyes on the treasure. One Eyed Willie's skull is sitting on top, adorned with a pirate hat. Never say die by pairing this with logo poster art Goonies t-shirts. In addition to the Goonies Silhouette tee above, browse the Goonies Clothing Gallery for more apparel like men's and women's clothes, kids shirts or hoodies.